What does it mean to be a Hostager? Where is the Hostager Farm? In the Kaupanger village of Song og Fjordane County Norway there is a Hostager farm, which, for many centuries has provided a surname to the people who lived there, and to their descendants in both Norway and America. Since the 17th century the spelling of the farm name has changed many times. It is unknown to me why it was desirable for our ancestors to make the spelling changes. Perhaps it was a matter of keeping up with the current spelling trends of the times, or perhaps record-takers wrote down the names as they saw fit when taking down information. Changing names makes keeping track of our ancestors more difficult. Searches for information need to be done with all the name variations to be complete. Different sources can list the same Hostager with the last name spelled differently, depending on the year the source was created. Usually a little detective work can determine whether two different spellings are in fact the same person. There are additional considerations that make it difficult to keep track of our “true” ancestors. First, it seems that there were two living quarters or houses on the farmstead. There were often many “groups” of Hostagers living on the farm at the same time. Second, the Hostager name could be assumed by a man through marriage or even by merely living on the farm. If a man married a Hostager woman and moved to the farm he was considered a Hostager. Even if a man moved to the farm without marrying a Hostager, he could possibly take the farm name as his own. The name Hostager transates to "autumn fields" or "fields that ripen late in the harvest". There are several ways to spell the last names of the people who came from our farm in Norway. The spelling of the farm name has changed several times since the 1600's. How you spell your name probably depends on when your ancestors moved away from the farm. Changing names makes keeping track of our ancestors more difficult. Searching through information and documents needs to be done with all the name variations to be complete. Kjelder (origin): Udt. haust/ao/kre. - i Haustakre BK. 46 a. Høstagger 1611. Rise og Høstager 1666. Høstager med Riise og Høningen 1723. Etymologi (etymology): Haustakr, af haust n., Høst. Paa denne Gaard skal Agrene modnes først langt ud paa Høsten (On this farm the fields shall ripen late in the harvest), senere end paa de nedenfor liggende Gaarde (later than in the lower-lying farms). Alm. skr. Høstaker. — "Rise" er Dat. Ent. (*Risi) eller snarere (or rather) Nom. Flt. (*Risar) af ris (hris) n., Ris, Kratskov (thicket brush forest) (Indl. S. 70). Om "Høningen" kan, naar gamle Former mangle, intet bestemt siges (About "Høningen" may, when old forms lacking, nothing specific is said). The farm is located in the county, Sogn og Fjordane, on the western side of Norway. The village of Kaupanger lies at the eastern end of the Sognefjorden, the longest fjord in Norway. The Hostager farm is a short distance north of Kaupanger. Kaupanger lies on eastern end of the Sognefjord, the longest fjord in Norway. This 1874 map shows Hostaker located above Kaupanger. 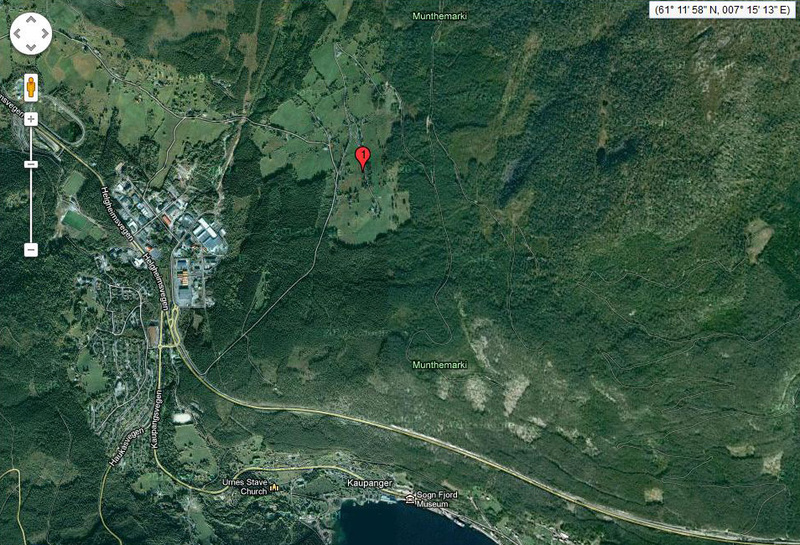 Here is the location of the Hostager farm in relation to Kaupanger, which can be seen at the bottom of the photo.